Professional, Unbiased Inspections For Your Peace of Mind! American Property Inspections of Texas is an independently owned and operated Houston Real Estate Inspection Company serving the Greater Houston and surrounding areas with over 22 years experience in the Inspection, Design and Construction of residential and commercial property. I personally perform all inspections and provide my customers with an extensive computer generated inspection report with pictures, based on the Texas Real Estate Commission's standards of practice usually on the same day via email after completion of the inspection. When American Property Inspections of Texas inspects the home you're considering purchasing all the accessible items listed on the services page will be thoroughly inspected. My inspections on average take between 3 - 6 hours to complete depending on the size, age, type and condition of the property. I take pictures of all the observed deficiencies & items of concern and at the end of the inspection I review each picture with my clients. I also give a verbal report on site answering any questions or concerns you may have. So when you receive your inspection report you'll already have a good understanding of what to expect. I also realize there are many home inspectors in the Houston area to choose from and I truly appreciate you taking the time to learn more about American Property Inspections of Texas. I am licensed Professional Real Estate Inspector with the Texas Real Estate Commission. Buying a home is probably one of the largest investments you'll ever make. It can be very exciting and yet very stressful at times. So by having your home inspected by one of our home inspectors will assist you in becoming more familiar with a property's condition. It may also uncover the possibility of major repairs before you purchase which is necessary to minimize any potential surprises. If you're selling your home, you may want a home inspection by one of our home inspectors before you put it on the market. This may give you valuable insight to what a buyer's home inspection may find while affording you the opportunity to make repairs that will put your home in better selling condition. After reviewing the report with your home inspector you'll be able to make a much more informed decision and a better understanding of the condition of the property you are considering purchasing or selling. If you are a current home owner, a home inspection could be useful in identifying existing problems or detecting potential problems. This may help eliminate costly repair bills. Supra key provided for your convenience! 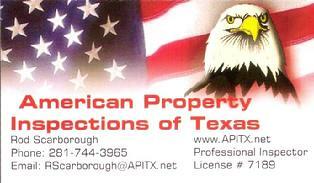 Thanks for visiting American Property Inspections of Texas! Your home for the Best Houston Real Estate Inspector.